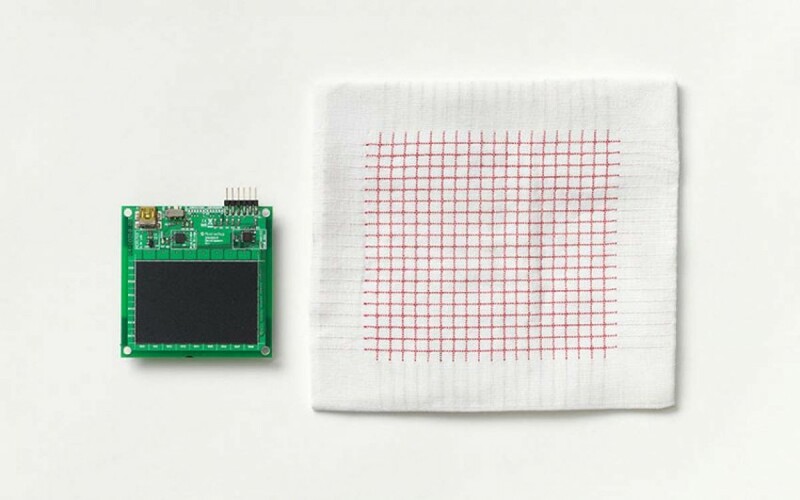 Google Goes E-Textile With Project Jacquard #WearableWednesday « Adafruit Industries – Makers, hackers, artists, designers and engineers! With Google involved with so many realms of technology, it’s no surprise that they have decided to start work in E-textiles. Plenty of work has already been done combining conductive thread with different fibers. The trick is how to make it process friendly to create many garments, and also how to get the electronics small enough to be comfortable. That is where Google’s Project Jacquard is heading, from this post on Popular Science. They’ve started with creating their own blend of fibers. The yarn created for Project Jacquard combines ultra-thin metallic alloys and common synthetic yarn such as cotton, polyester or silk. The end result is a fabric that’s strong enough to be used in common pieces of clothing and home interior items. The yarn is meant to be indistinguishable from common household fabrics. The challenging piece, as I mentioned, is the electronics. Google seems to have developed a nice tiny package. The computer components created by the Jacquard team are no bigger than the size of a button, and they’re capable of capturing touch interactions and various gestures. The commands received by the sensor would be wirelessly transmitted to a mobile phone or other device within range. Speaking of wireless, if you check out the video, there seems to be a Qi charging device embedded into the pocket of the suit jacket, which can be very helpful for charging phones. Again, we’ve seen this done before, but it looks like the team is creating a full solution–from fibers to microcontrollers and sensors, and software. In order to work on a seamless fashion solution, they have recently started a partnership with Levi’s. I started projecting what that would look like. First, jeans are something that all people wear, so it is a great first target. Special stitching could appear on back pockets or along front pocket edges for popular phone tasks. In fact, pockets could become textile speakers. Snaps could be used to attach removable sensors and others may be able to use rivets. The zipper could be used for powering off a device–really. The real interesting question is whether they are working on energy harvesting. Wouldn’t it be cool to have a knee flex convert to energy? If they can get that going, I may be interested in their jeans. Learning how to use less energy or use existing energy more efficiently is the biggest challenge. So, are you interested in experimenting with conductive thread and switches? Check out our fun tutorial on a Zipper Switch and see how natural everyday movements can power something on and off. Want to turn off some nasty TVs at your local dive bar? This could be your BFF.